The outdoors is a special place…all that it encompasses also has special meaning. The sounds, smells and sights that happen in the wild are always the best and for me, keep me fired up and pushing on. Through the years the friendships developed with woods, water, grass, animals, shotguns and fly rods are also very special. Bonds made while walking a Nebraska prairie, paddling over a Missouri lake or wading an Indiana stream are and always will be the best kind! When I was young and green and barely 23 years old I moved to Wyoming. It was a big land full of outdoor opportunities and like a kid in a candy shop I absorbed the experience; I also took the time to notice that the folks I liked were the ones who hunted and fished. I kept my eyes open and learned a lot about the Cowboy state, its wildlife and the people, good people who took pride in keeping the land clean while hunting and fishing. I tried my hand at a little guiding for sage and blue grouse and one of the first groups I guided came to me via Minnesota. We had a couple of good days, several birds and lots of nice dog moments were had. The last night the group of 5 men took me out for a meal and it was at that time that I found out one of the party was actually one of the wealthiest Minnesotans at that time. I still remember the impact it had on me for this ‘gentleman’ was just like anyone else. He had a love for wildlife and treated everyone with class and frankly I would have never known he had any more money than did the rest of the group…he was an exceptional person! Fast forward a few years to 1993. I had moved back to Indiana and I planned a trip into northeastern Nebraska with dad and my good friend Charlie Warthan. It was an exciting time…while I had done quite a bit of pheasant hunting it was some new land and having two good men along was comforting. I had made plans to meet a guy and eventually the plan was to share a hunt; his pheasants for our turkeys. Fate has a fickle finger and to save a long story my plan didn’t work out…at all…or did it? While the hunting set up was sour we had spent a nice night at a local B & B and returned there to talk to the owner and see if there was any local hunting to be had since we were there and it was a long way back to Indiana. It was there and then that I met one of the finest men of my lifetime. Norm Lorenz, who along with his wife Jacquie, owned a beautiful bed and breakfast, stepped up and took us to a piece of ground that he knew might hold a bird or two. Little did I know that he was actually checking out us “Hoosier Greenhorns”; he wanted to see if we were safe and if we knew anything at all about hunting birds? We must have passed the ‘Norm’ test because twenty years later we still communicate via an occasional phone call and at least a couple of letters. Norm is and always will be one of those men that I picture as a total class act; he and my dad were just cut out of a different mold. 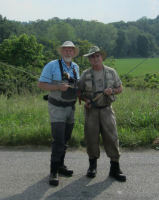 A couple years back I was on a fly-fishing trip with Vickie into the heart of Missouri and on a call home Harrison said there was a guy who had called and had talked to him at length about fly fishing; this guy had read one of the columns in the Journal and was interested in getting some more information. A few days later I returned home and dialed up Frank Terkhorn for what I expected to be a short phone call; 45 minutes later I knew that this was another one of those different guys…a guy who treated people well and was seriously interested in fly fishing. 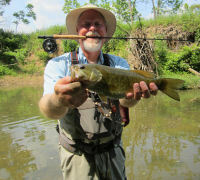 Over the course of these past two years we have talked many times, tied a lot of flies, kicked our float tubes over miles of water, walked down and fell into many small streams here in Indiana and my opinion of this humble chap is even better today than it was after that first phone call. Outdoor people are good people. OK, for sure there are bad people in all walks of life…that is just the way it is…but time in and time out there is nothing like a friend that you have shared memories, travel time, sunrises and sunsets with. I appreciate the solid grounding that I find in good men and women that like to hunt, fish, camp and simply be outdoors. I hope that you have one or possibly many of these great outdoor folks in your life; if so, you are lucky, let them know how you feel and never take them or our great outdoors for granted. Give that special friend a call and see if you can find time to hit the water…I know the two of you will enjoy each other’s company and Enjoy the Great Outdoors. Check out this collection of photos of Jeff and Frank fishing. It’s entitled Fishing With A Friend.